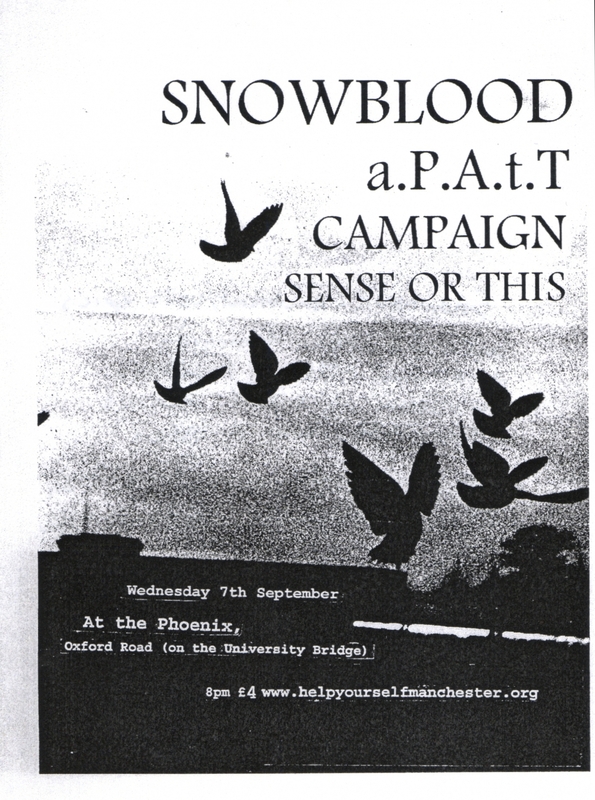 Scotland's SNOWBLOOD played in Manchester at least 4 times during their existence; this would have been around the time of their second album. In fact, I think they had played the Phoenix just that June before. As with many of the gigs at the Phoenix (most put on by Daniel/manchestershows.cjb.net) this gig was on the open floor of the top room, accessed from the old bridge. According to my records Liverpool's a.P.a.t.T. cancelled, and BURNST played instead. I imagine I was quite happy about this, because it's otherwise rather a "blips and beeps" line-up by my standards. CAMPAIGN (aka Smear Campaign) was Stuart Arnot doing drones/improv with a trumpet and effects pedals. SENSE OR THIS was Dom (driving Snowblood, as it happened) doing electronic and laptop stuff. Flyer by Anthony, from an image found in an old photography magazine.